The Marcy Dual Roll Crusher meets most requirements for intermediate crushing of friable rock or similar rock like substances, reducing them down to -10 mesh (nominal) in a single pass. 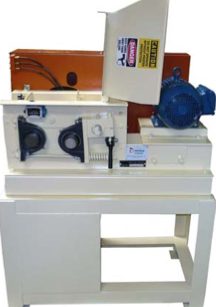 A roll crusher has a very narrow particle size distribution as it produces few… Typically, the crusher has a 3.7 – 4.0 crushing ratio. Crusher is capable of 1/2 -20 mesh closed side setting, with 80% of product typically being -20 mesh with rolls closed. Roll crushers are a intermediate crushing machine. that has a very narrow crushed particle size distribution. Fabricated steel, high capacity tilt design feed hopper with electrical safety interlock. Crusher and motor mounted on heavy steel base. Roll adjustment made quickly with hand lever. Strong relief springs protect rolls. 010C-005 6.5 X 6 3,000/1363 V-belt, 2 HP 680 Lbs.